Mt. Walker Trail and Viewpoint Map. Mt. Walker is densely covered with 100 year-old Douglas-fir trees that have grown up in an area once burned by wildfire. Native Pacific rhododendrons grow along the road and at both North and South observation points. The large flowers are bright purplish-pink and bloom May to June. Mt. 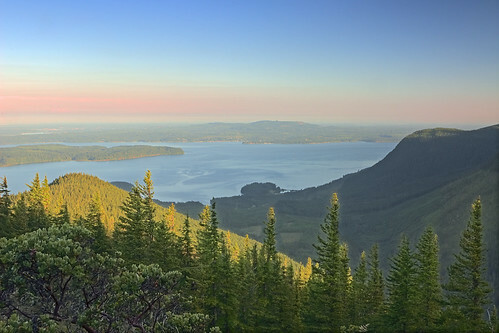 Walker is the only peak facing Puget Sound that has a road to its summit. Both viewpoints have short trails to the viewing area with interpretive signs. The south viewpoint has short compacted gravel accessible trail out to to the lookout area that also provides a nice bench. Facilities: Two viewpoints (North and South) with parking areas and vault toilets. The vault toilets at the south viewpoint parking area are accessible. Two picnic tables at the North viewpoint. No water. 4/15/2019 Mt. Walker road is closed at this time. From Quilcene, WA take Highway 101 south forfive miles to Forest Service Road 2730 (Mt. Walker Viewpoint Road). Drive 4 miles up a gravel road to Mount Walker's summit (2,804 feet). Mt. Jupiter can be seen through the notch just west of Buck Mountain. It is the closest high peak to Hood Canal. Mt. Constance is the third highest peak in the Olympics. Its gigantic rock faces are some of the most spectacular on the Peninsula. Big Quilcene Canyon is fed by hundreds of smaller streams. Mt. Baker is the fourth highest peak in Washington state with a glacial system second only to Mt. Rainier. On a very clear day, Mt. Baker can be seen to the northeast. Buckhorn Mountain consists of thee peaks just north of Marmot Pass. Quilcene Bay is a sheltered arm of the Hood Canal, providing boat haven, and oyster farms for the world-famous Quilcene oysters. Hood Canal is a vast arm of Puget Sound. The trough was created as the Vashon Glacier gouged its way southward during the glacial period 10,000 years ago. Hood Canal Floating Bridge links the Olympic and Kitsap Peninsulas. Mount Rainier, at 14,410 feet, is the highest peak in the state. The mountain is an ice-clad volcano rising over 9,000 feet above the surrounding foothills. Its glacial system is the largest on any single peak in the contiguous United States. In the distance, major metropolitan areas can also be seen: Everett 33 miles away, Seattle, 28 miles away; and Tacoma 39 miles away. On a clear day you can see the Seattle Space Needle. Many visitors each year enjoy the panoramic views of Mt. Rainier, Puget Sound and Seattle from the summit of Mt. Walker. See: Mt. Walker Trail #894. Mt. Walker is densely covered with 100 year-old Douglas-fir trees that have grown up in an area that once was burned by fire. Native Pacific rhododendrons grow along the road and at both viewpoints. The large flowers are bright purplish-pink and bloom May to June. Mt. Jupiter can be seen through the notch just west of Buck Mountain. It is the closest high peak to Hood Canal. Mt. Constance is the third highest peak in the Olympics. Its gigantic rock faces are some of the most spectacular on the Peninsula. Big Quilcene Canyon is fed by hundreds of smaller streams.